This book was so-so. In the beginning, there was an apple— And then there was a car crash, a horrible injury, and a hospital. But before Evening Spiker’s head clears a strange boy named Solo is rushing her to her mother’s research facility. There, under the best care available, Eve is left alone to heal. Just when Eve thinks she will die—not from her injuries, but from boredom—her mother gives her a special project: Create the perfect boy. Using an amazingly detailed simulation, Eve starts building a boy from the ground up. 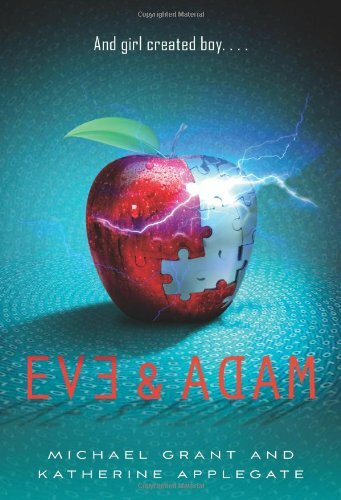 Eve is creating Adam. And he will be just perfect... won’t he? It is set in present day San Francisco. I had many issues with it. For instance, Evening had to bail out her best friend Aisling's drug dealer boyfriend. Why did she have to bail him out when she thought he was a jerk. Also, Solo's dead parents were somehow the villains of the book. Besides, I just wanted to know more about Solo, his parents, and Terra Spiker. The ending was odd as well, Adam ends up with Aisling after her boyfriend gets shot in the stomach. All in all this was an original quick read of the book that had some plot and character issues but was overall so-so.